Image after all post processing is complete. 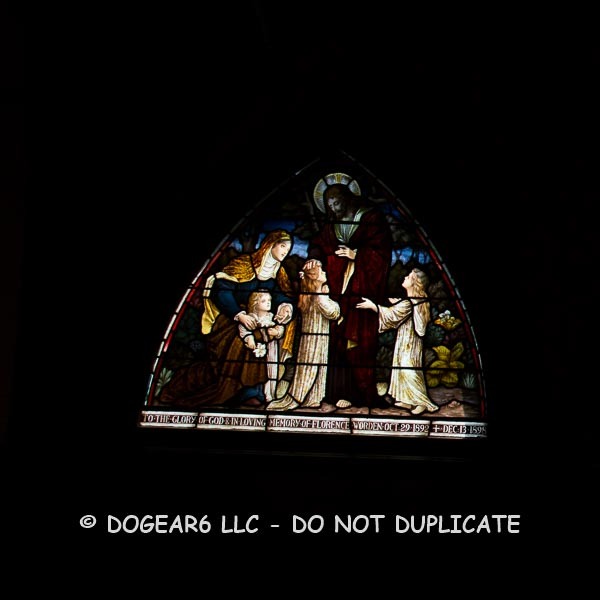 Taken at St. Saviour’s Episcopal Church in Bar Harbor, Maine. 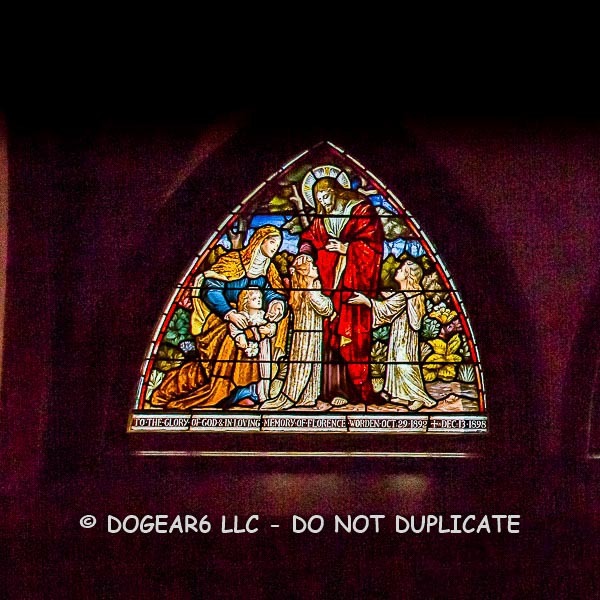 A few weeks ago, I posted stained glass photos that I took at St. Saviour’s Episcopal Church in downtown Bar Harbor, Maine. Everyone ooh’d and aah’d appropriately, then one of you stuck your hand up and said, “How did you do that?” It turns out she has a number of stained glass pictures taken during a trip to Europe and hadn’t figured out how to process them up. So this is going to get a bit technical and take several posts to explain, but here’s how I did it! The first thing is to select a photo that has sufficient detail in it. 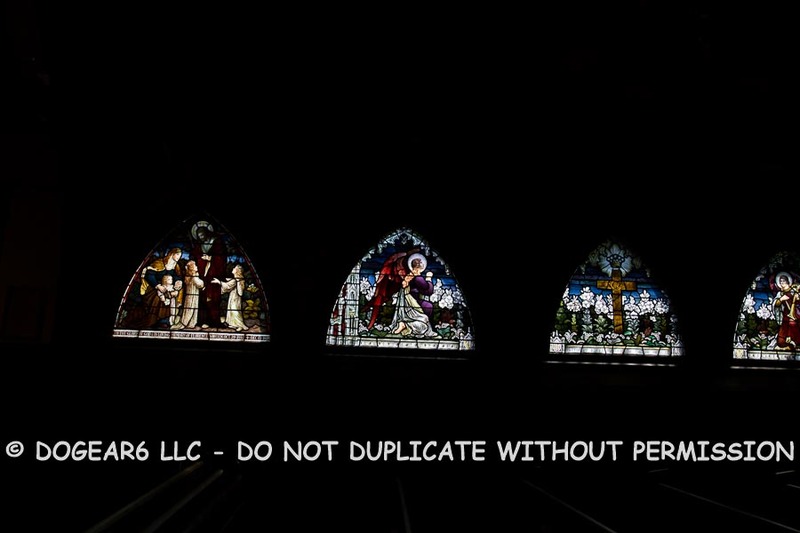 I shot these with a high ISO because of how dim the church was and I was hand holding my camera. Had I been tripod mounted, I could have used a lower ISO and had less noise (i.e., graininess). But I didn’t have my tripod with me and I don’t know that the church would have let me set it up anyhow. I routinely bracket my shots. Bracketing is where my camera takes a picture at the normal settings, then another one that’s darker and another that’s lighter. So I take 3 pictures of every shot that I want. This helps improve the odds of getting a keeper. Taken with normal settings, but you can barely see the texture in the robe and flowers. Although technically too dark, you can see all the texture in the stained glass. The picture on the left is with normal settings. Although it seems to be a better brightness, the details are lacking in the robe, flowers and even the hair. The one on the right is technically too dark, but you can see a great deal more of the detail in the robe, flowers, and hair. The actual shot without any adjustments. Awesome! Not. I’m slanting down to the right and the top piece of each stained glass has a shadow, probably due to eaves outside the window. Since I want each photo to be on its own, so I can blow it up and show the details, the first thing I do is crop them each out. I start by opening the develop module (the up arrow). Select the crop tool (down arrow on the left). Select a 1×1 crop size (down arrow on the right). Make sure the little padlock next to the crop tool is closed to ensure the photo stays proportional when you are cropping. I drag the tool around the photo and leave as much background as possible. I’ll crop it again later to a small size. This leaves me room to work, especially since I’ll be straightening the picture and might run an edge right off the end. Because this is crooked, I also got the angle tool (the far right arrow pointing to the right). I put it on the bottom of the tool and drag it across. 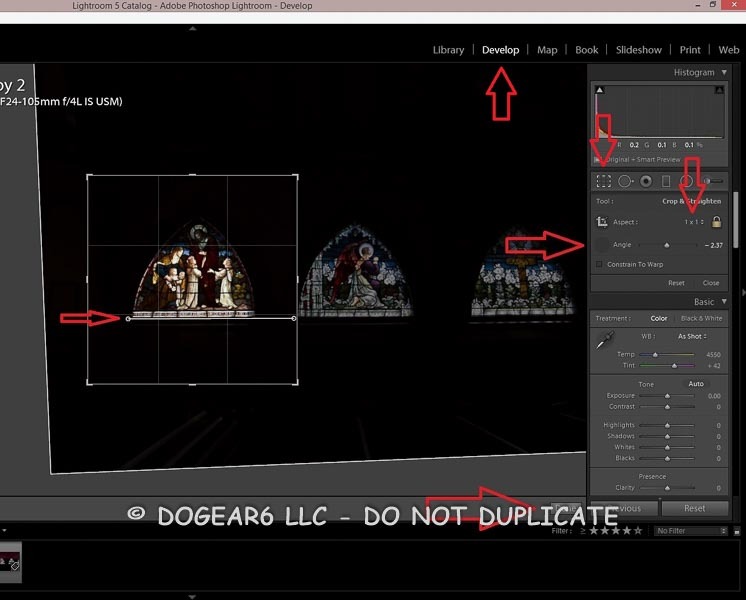 When I release it, the picture will automatically straighten (far left arrow pointing to the right). If I don’t think it’s straight enough, I can also grab any corner of the crop box and rotate it until I like how it looks. Click done at the bottom to crop and level the picture. Open in the develop module, then crop and level. I now have a cropped picture to work with. I now make adjustments for exposure, highlights and shadows, contrast, clarity, and vibrance. If I’d taken the picture in jpg, the camera would already have made those decisions. Since I shoot in raw, I have to make these adjustments. Unfortunately, in the course of all this, the background is now a grainy maroon. I’ll fix that later in Adobe Photoshop. I adjusted the dark part at the top with the graduated filter (down arrow). I clicked the pin above the stained glass, and rotated it so that it lightened the area above the pin (the pin is in the circle). The default is to lighten the area below the pin. To rotate, move the cursor to the pin until a double headed arrow appears. Then I can rotate it until the top and bottom are exchanged. This is harder than it sounds, so if it gets too frustrating, I delete the pin (with the delete key) and start all over again. Then adjust the exposure, contrast, and other sliders until that top piece looks like the rest of it. This takes experimentation to figure out how big to make the graduated filter (how far down does it come) and what the correct adjustments should be so it’s not too dark, not too light, and the colors don’t get weird. Use the graduated filter to adjust the darkness at the top. I also sharpened the picture, which increased the noise. I then applied a noise reduction to get rid of the excess graininess. I have to be careful with noise reduction, as it can make the picture look soft if it gets too smoothed out. The upper arrow pointing right shows a blow-up of one small piece so you can see the detail better. 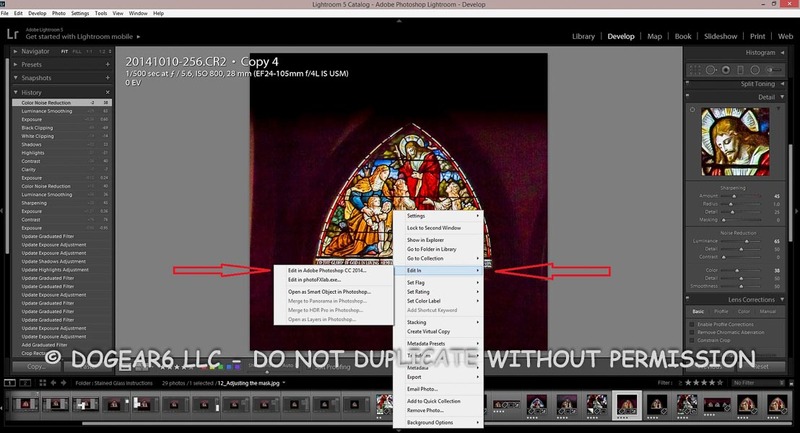 Adjust the sharpening first, then get rid of enough noise to smooth out the picture but not have it get soft. The lower area pointing right shows the adjustments I made to this picture. The arrow pointing left shows the history and what the exact changes were. Sharpen the picture, then reduce the noise. This is how it looks so far. The graininess is greatly reduced from the picture above (when the graduated filter was being applied). Close-up after sharpening and removing noise. At this point, I’ve done everything I want in Adobe Lightroom, so it’s time to take this into Adobe Photoshop for more sophisticated and complex adjustments. Do this by right clicking on the photo, select “edit in” from the menu that pops-up, then select Adobe Photoshop in the next menu that pops up. I now wait a few minutes for Photoshop to open up and analyze the picture. Moving the picture into Adobe Lightroom for editing. I’m going to end here. My next post will show how to continue processing this in Photoshop. Amazing Nancy! 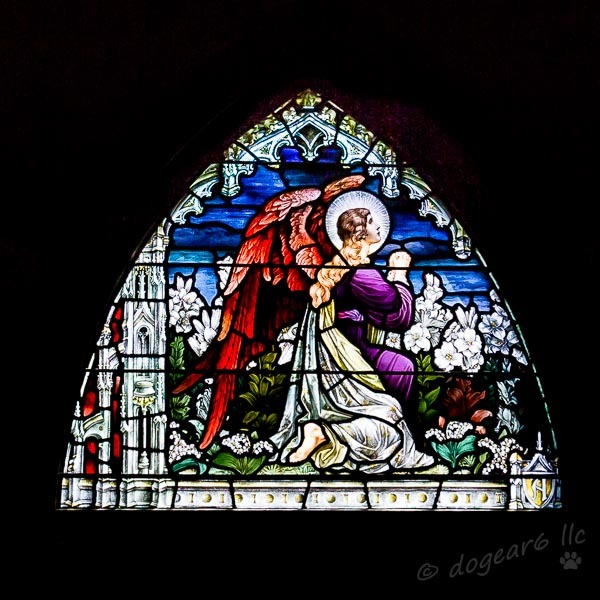 I wish I knew more about photography so I could understand it a bit more, but the pictures of the beautiful windows is awesome! Thanks Maxine! The photography is a great object lesson in the learning curve. I understand and do so much better than I did even several years ago. I’m surprised I’m doing as well as I never set out to get this good, but it’s happened after lots and lots of practice. Of course the days I’m stomping mad about it, I have to remind myself that I use a $100k piece of software at work. If I can do that, I can learn Photoshop. Not that it ever seems to matter if I’m that mad. Wow! I am not technologically savy, but I can appreciate gorgeous photography when I see it! Thanks Amanda! That’s really sweet of you to leave a comment. This is more technical than I usually do, but it helps me to remember the steps should I ever do this again. I’d rather not do it again – it took way too long – but it turned out really great in the end. So thanks for hanging in there while I get this out of my system and answer questions for my blogging friend who would like to do this to her pictures. I’m sure your photography loving friends are so grateful. I once did a 1-1 photography tutoring session with my camera and it was one of the best things I ever did. Maybe you can even offer to do that for some…I mean, since you have so much spare time, ha ha! My husband does photo consulting like that and his clients have said the same thing, mostly because he focuses on exactly what they need, unlike a generic course that has a lot of stuff you won’t really use. But yes, I’d probably do pretty good myself in teaching with all MY spare time! Of which I have SO MUCH. Not. Thanks for the laugh! Your instructions are so good and the illustrations help and are in the right spot. Thanks for all the hard work and sharing it! Thanks Phil! I appreciate the feedback that the instructions and illustrations are making sense. When I did the original post, I commented that it took me most of the day and I was really frustrated. You’re right on when you say it’ll take most of the day. It did for me. I was really torn between I did something great and how very pissed off I was to give up my day for a handful of pictures. Still, it was a good learning experience for me and I’m losing my resentment over taking so long to do it. Lightroom is almost identical to camera raw processing except the user interface is friendlier and easier to use. The concepts and techniques are pretty much the same for the developing. I will learn a lot by your posts. Debbie – I hope you do! Other photographers have graciously answered questions for me. This is pretty involved, but I think if I don’t write it down, I’ll be asking my husband the same questions over and over. He didn’t help with a lot, but he did explain the masks to me. Photoshop is really powerful and I don’t really use it very well. I think I should clarify this. The Lightroom Develop Module is nearly identical to camera raw in Photoshop except Lightroom made it much friendlier. The catalog feature in Lightroom is sort of similar to Bridge, but much more powerful. Lightroom also has modules for printing, web, and slideshows, which neither camera raw or Photoshop have. A lot of photographers have started to use both for that reason, but what I’m explaining here you could do in just Photoshop. This was over my head for a long time too. I went from Photoshop Elements to Photoshop because there were a few things I really wanted to do and Elements simply didn’t let me. I not an expert in it, so my photo are honestly “just good enough” and nowhere near perfect. But for my fellow blogger who asked how to do this, “just good enough” was okay for her. I am going to do a post at the end on resources for learning Lightroom and Photoshop, both free and for a fee. I think you’re not the only one who is at a beginning point on this. Also, I really liked your post about your grandfather’s letters. I want to write a longer response to you, but probably not until the weekend. It was a great post though.